The OnePlus One is the most affordable high end phone you can get today, there is no question about that. And it appears that the One could be sold in another online portal in India. The phone debuted in the Country, as an Amazon India exclusive, in December 2014. Now, the above image is a teaser from Flipkart. There are five clues in it, which suggests it could be the OnePlus One. 1. The words “The One”. 2. The slightly protruding power button on the right side. 4. The Sandstone texture in the image’s background. 5. 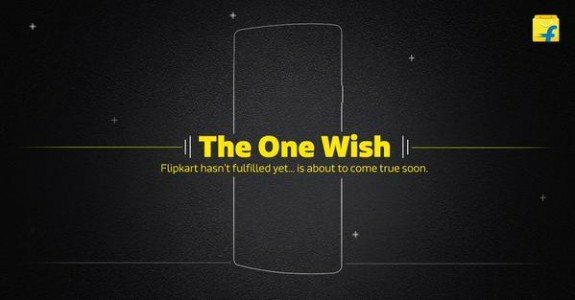 The One wish “Flipkart hasn’t fulfilled yet”. Flipkart has not sold the OnePlus One, but it has almost all other high end phones in its online shelves. It could also be a double play cheekily aimed at the “Amazon Fulfilled” service, which its rival offers. The OnePlus One could be available on Flipkart soon, but we don’t know how soon it could arrive. Om a side note, the OnePlus One 64GB Sandstone black variant, is being sold for just Rs. 19,998 on Amazon India, today. You still have a little over 13 hours left to place your order.